Any ideas anyone - location in particular? I have no idea about this one, but the signals and the gradient post on the right side are good clues. It seems to be a falling 1 in 207 (or 2 something 7), changing to a rising gradient. If the original print shows these figures clearly, then identifying the location should be fairly straightforward, using gradient tables, gradient diagrams, and maps. But if someone can identify the buildings, that would save a lot of effort. As Harry says, the gradient down is 1 in 2x7, but x can't be determined from either the original 3�in print or the scans taken. However it's most likely to be 267, 287 or 297. Can't help at all with the up gradient I'm afraid. I have no knowledge of the location, but Coal Tank no. 27664 (if I have deciphered the number correctly) was allocated to the following sheds post 1934 (when it gained the numeral 2 prefix to its engine number). Birkenhead Nth, Crewe South, Llandudno Jct, Monument Lane and Shrewsbury. The image is too pixelated to determine the shed code from the photo, but perhaps one of these allocations may provide a clue as to location. Looks like the West Midlands to me. Perhaps Perry Barr North Junction. The signal is quite distinctive and may lead to the solution of this one. As well as the three main dolls there is a small "main to loop" arm between two of them. So four possible routes from this line. I would guess a double track line approaching a quite large station or junction - ring any bells, anyone? There is also a double disc at the crossover, by the looks of it. It should be possible to confirm or deny any suggested location quite easily! Sorry, but I am fairly sure it isn't Perry Barr North Junction. I used to live quite close to there, and I don't recognise anything in the photo. I thought it might be Bushbury No. 2 (before the wartime Down Yard extension) but the topography is all wrong. In fact I'm pretty sure there is nowhere in the West Midlands that fits the bill. I think we ought to be looking further north - maybe South Lancashire for example? I think this is West Kirby on the Wirral Railway. The train is about to pass under Bridge Road and enter West Kirby Station. The building on the right is the Crosville Bus Garage. The only thing that puzzles me is the LNWR signals. However, the train is at the junction with the Birkenhead Joint Line - the lower signal on the right as we look at it would be for the joint line - and, since the LNW signalled the joint line this may account for the LNW signals. I do have a picture taken from the same spot looking the other way and the starting signals appear to be LNW although the box is a Wirral Railway one. I also have a picture of 27664 on Birkenhead North Shed. Brilliant! I'm very glad that Ted Lloyd has solved this baffling puzzle. Ordnance Survey plans corroborate his identification of West Kirby. As for the L&NWR signal on the Wirral Railway, if it wasn't set up by some arrangement with the Wirral when the Birkenhead Joint line opened in 1886, maybe the LMS put it there? Long ago I was told by a clerk in the Signals & Telegraph Dept in Manchester that when the famous Rugby gantry was dismantled in 1939, some of the components were re-used as individual signals on ex-Lancashire & Yorkshire Railway lines. So perhaps, after 1923, this one came from somewhere on the L&NW, as a replacement of some ancient Wirral Rly signal. Well done, Ted! Yes, everything fits. I have also looked at the OS plans myself. These confirm the bus garage (built between 1911 and 1935, nearer the latter by the looks of it), terraced houses in 2 cul-de-sacs, curvature, crossover, signals. The houses look to be of late 20s /early 30s style which fits (not shown in 1911). I am hoping that someone will confirm that the line from Bidston falls at 1 in 2x7 approaching West Kirby! The up advanced starter appears to have a Rule 55 diamond on it, which is correct. The photo is after 1934 (thanks, Pete) and I presume it was in the period when 27664 was at Birkenhead North. When was this? The line was electrified in 1937/38 (I think) so it is obviously before then. Between 1934 & 1938 then, can anyone improve on that? Do the coaches look right for a Wirral train of the 1934-38 period? There were two terminal platforms for the Wirral line, plus a through platform for the GW/LNW Joint line from Hooton. The two higher arms are for the former and the lower, right hand arm for the latter. Therefore this train is terminating at West Kirby. The small "main to loop" arm might lead into the "up & down" goods loop and/or into any or all of the three other groups of sidings. Opinions differed as to whether a facing movement from a running line into a dead-end siding should be regarded as a signalled movement. In the absence of a signal, a movement would have to proceed onto a running line and shunt from there, or be handsignalled past the signals at danger. There might be several possible explanations for the LNWR design signal. WR got the LNWR to install it eg on opening of the Joint line in 1886 or on doubling of the WR line in c1899. Could be any time after 1923 when the signalling on the ex-Wirral line was maintained by W division of LMS Signal Dept. There are files in the MT6 series at Kew for the 1886 and for the 1895-1900 work, which hopefully might each contain a plan showing what the signal was like then. Other than saying that, this is not the place to get into a long discourse on the operational and infrastructure history of West Kirby! Later signalling plans show a straight post signal with call-on arm and route indicator. This had 5 routes, with separate "L" - loop and "S" - sidings. It may have been installed in the 1940s or 1950s to replace the one in the photo. Incidentally, re-use of a steel signal such as the Rugby gantry is quite possible. Re-use of a wood signal is much less likely; these have only a limited life, even if well maintained and the effort of dismantling, refitting and moving would probably not be cost-effective. Just to confirm the allocation of no. 27664 at Birkenhead North. The engine may have been a long term resident, as it was there in 1920 as no. 148, and returned there following repair at Crewe in January 1925 (as no. 3720). It was at Burton following repair at Derby in 1927 (when it was renumbered to no. 7664), but was back at Birkenhead for February 1928 and also there in January 1935. 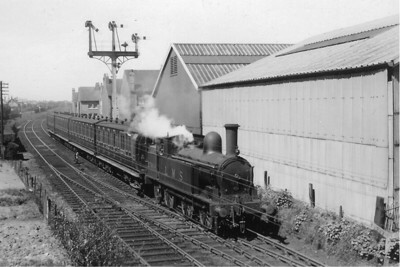 It departed on the closure of Birkenhead North shed, following electrification of the Wirral lines, in March 1938 and went to Crewe South. So the date range of 1934 to 1937/38 sounds most likely.